Before retracing Jose Rizal's steps in Hong Kong and visiting the site where Marcela Agoncillo made the first Philippine flag, Tutubi met his affable guide for the day at the posh Mandarin Oriental hotel in Central. 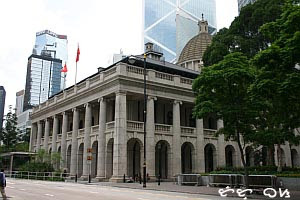 Near the hotel, is the granite neo-classical former Supreme Court building of Hong Kong. This old edifice used to house the Supreme Court before the colony was turned over to China in 1997. 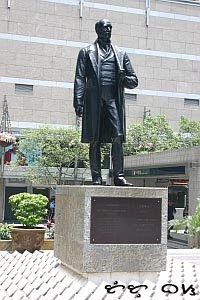 Beside the building is Statue Square where a bronze statue or Sir Thomas Jackson Bart (bart stands for baronet), former general manager of Hong Kong Shanghai Bank, stands regally watching over the square. 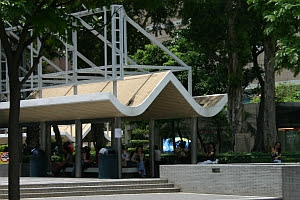 Incidentally, the square is a favorite meeting place of overseas Filipino workers (OFWs) in Hong Kong, mostly domestic helpers sacrificing for their family back in the Philippines. It was here where some Filipinos approached Tutubi and offered him various Filipino food including halo-halo, but didn't order one. 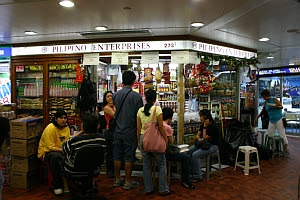 After visiting the Rizal markers and Morrison Hill Road, went to the nearby Worldwide Plaza, Tutubi came face to face with Filipinos hawking various stuffs from cellphone loads, DVDs, callcards and what he's hankering for after 4 days of eating Chinese food: Pinoy food prepared by Filipinos! It's in this little stall where they serve tasty embutido that ms Escoda, loved and even asked for the recipe. Near Worldwide Plaza on Des Voeux Road are Little Quiapo and Jollibee Hong Kong and other pinoy restaurants serving Filipino fastfood. Tutubi wondered how would Jose Rizal react if he sees his countrymen living in exile, not because of oppression but of poverty, more than a hundred years after his death. Looks like a pretty nice and modern place! At least Hong Kong has Flipino food prepared by Pinoys. Unlike over here in Malaysia, I can't find any ... Or it could be I don't know where to hunt for it. kyels, i haven't explored KL much when i was there. most Filipinos i met were entertainers belonging to the band at Corus Hotel where I stayed. ah, the filipino cookies, brown on the outside, but with white cream inside. caused a fuss locally a few years back. anyway, what would be rizal's reaction? he might write another book. but i don't know if it would be a hit. perhaps he might try a movie instead. he might work in an NGO but get branded as a communist. or he may work in the government but will be overwhelmed by political intrigue. i remember raul roco. this post is the anti-malu whateverhername is post.